China, Chocolate, Cannabis and Bongs & Thongs — Merry Christmas to All! I don’t have any ghosts of Christmas Past, Present and Future to offer you. But I do hope you are merry, kind and generous this holiday season, and that you find the same qualities in everyone you meet. And here are some interesting stories and charts you might want to keep in mind as 2018 winds down. China says it will temporarily halt its additional 25% tariff on cars made in America. The Chinese are making a real attempt to cool the trade tiff and head off a trade war, observers say. Unless the Congress and Senate pass a continuing resolution (CR), the government will run out of money for some operations on Friday, Dec. 21, and those operations will shut down. Departments affected include Homeland Security, State, Justice, Commerce and more. This fracas is nominally over funding for a border wall, but it’s much deeper than that. Otherwise, the Republican House and Senate would already have passed the CR and President Trump would have signed it. I gave my Supercycle Investor subscribers a more in-depth take on this. The bottom line is the fight over the CR will add to volatility going forward. Fidelity explains how a government shutdown may affect investors. It’s not as bad as many think. But fear of the shutdown definitely rocks the market. 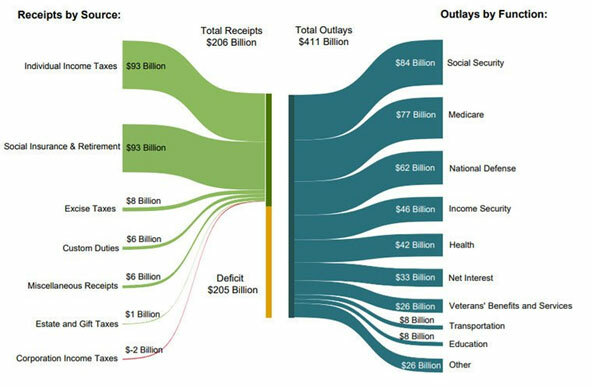 A strong economy typically leads to narrower deficits, as rising household income and corporate profits help boost tax collections, while spending on safety-net programs tends to decline. But that isn’t happening now, primarily because of the tax cuts. 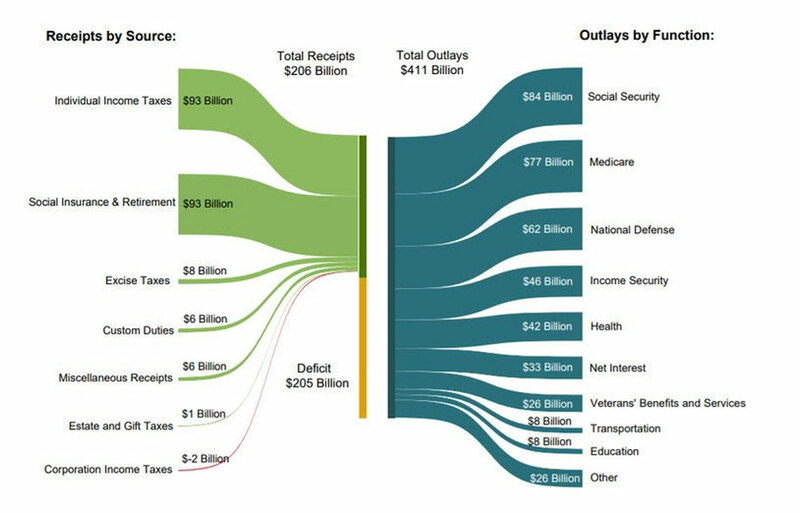 The budget picture will continue to worsen as the U.S. taxes individuals and companies less and Uncle Sam spends more, mostly on defense and benefit payments to an aging population. Have fun discussing that with your relatives at Christmas! I’ve been in parts of Mexico where the roads are paved with gold. Literally. By that, I mean crushed waste rock from gold mines is mixed into the tar that paves the roads. But I’ve never traveled on a road paved with chocolate. I shoulda booked a flight to Germany! That’s a metric ton of chocolate (or more) coating a road in front of a chocolate factory in Westönnen, Germany. 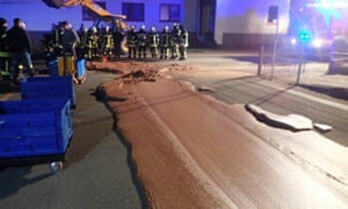 A storage tank at the factory burst, and the chocolate made a break for it. It flowed out, then froze solid on the road. If this happened in America, I’m pretty sure local kids would have turned up to grab chocolate by the yard. However, since it’s Germany, two dozen firefighters used shovels and torches to remove the sweet stuff. Canada legalized recreational marijuana earlier this year. But that legalization did not extend to edibles, which are very popular. In fact, I even wrote an article about them, which you can read HERE. Edibles are a huge part of the market. Colorado’s sales of edibles and concentrates rose from 26.3% of the market in 2014 to almost 40% in 2017. The buzz was that Canada would have to wait until later in 2019 to get legal edibles. But now, draft regulations are expected to be released before Christmas. In other leafy news, Congress passed a farm bill that allows nationwide hemp cultivation for any use — including Cannabidiol (CBD) oil. The legislation was championed by Senate Majority Leader Mitch McConnell (R-Ky.). McConnell may be from a conservative state, but he’s definitely pro-farmer. In other pot news, it is now legal to use marijuana, medically, recreationally or both, in 33 states. Party on, dudes. And since marijuana use is increasing among seniors, party on, Grandma and Grandpa! Also, Nevada just approved 61 more cannabis stores. That nearly doubles the number of pot dispensaries in the state. Michigan just turned back an attempt to make growing pot at home illegal. I think that’s a slap in the face for Big Weed. Good! Shaver is pressing ahead with a C$3-million lawsuit, trying to make Ontario safe for home pot smokers, and (presumably) green thong wearers. I could show you a photo of Mr. Shaver in his thong, with his bong. Consider it my Christmas gift to you that I do not. Love the info Shawn. Thanks!